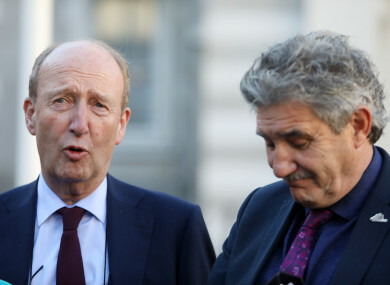 Shane Ross said the Independent Alliance secured commitment from government for the granny-flat grant. THE GRANNY GRANT for childcare might be dead in the water, but ‘granny-flat grants’ are very much still in the pipeline, according to Transport Minister Shane Ross. During the summer, the Independent Alliance said grandparents should get an annual payment of €1,000 if they help out with the childcare of their grandchildren. However, cold water was quickly poured on the idea by Fine Gael ministers. Fast forward a few months, and apparently a late night pre-Budget meeting with Finance Minister Paschal Donohoe has secured commitment for the granny-flat proposal. The idea aims to meet the needs of older people by converting their homes into two separate units. It would involve the grant being used to convert family homes into self-contained ground floor accommodation for use by the older home owner while the upstairs area would become available for lodgers or other family members. So, who is saying what? Ross said the measure is not written down in today’s Budget, but he is adamant there is a commitment to roll it out. “We got commitment that he [Housing Minister Eoghan Murphy] intends to do it,” said Ross. He said a scheme, which is already in train and known as the Abhaile scheme, is going to be assessed to see if the idea is a runner. Murphy confirmed the “pilot project” is just one home in Clondalkin, adding that any future funding for the granny-flat grant is dependent on the success of this one property. The housing minister said there would need to be a “proof of process” to see if the concept works, and then it will be expanded. TheJournal.ie asked the finance minister about the promise made to Ross. Donohoe confirmed that yesterday evening a further meeting with the Independent Alliance was held and he agreed to work with the housing minister over the coming year on a project to convert homes held by older people so as to provide more accommodation. “It’s a sensible idea,” said Donohoe, who added that it is often the case that the design and implementation of such schemes can take time. He added that sometimes it is not “appropriate” to announce such measures on Budget day, but said it is something the “government is willing to work on”. The news of a late-night agreement for the grant caused laughter in the Dáil this afternoon when Labour’s Alan Kelly said he had a “funny feeling” the one home in the Abhaile scheme will be in the Dublin-Rathdown constituency. Email “Late-night talks secure unwritten granny-flat grant promise, dependent on one pilot property ”. Feedback on “Late-night talks secure unwritten granny-flat grant promise, dependent on one pilot property ”.